Visiting the first of March 2014. We hope the train is running on the track and the miners are in the shafts for our enjoyment. We just visited Disneyland two weeks ago, our first visit. Well done Walt! Looking forward to get back to the WDW! my husband and I have been going to Disney for well over 20 year I got to see 20,000 leagues under the sea submarine he is so sad he never got to go on that we are going again to Disney in September 2013 as Florida residents we will be back often are they ever gonna do anything with that submarine ride? We can’t wait to go on this new ride next year. I finally broke down and planned a trip this year though. Life without Disney is pretty boring. I’m really excited for this ride! The part of Snow White where the Dwarves are in the mine, and there are so many gorgeous gems is my favorite part! Jennifer – it really looks as though this is moving along faster than anticipated! 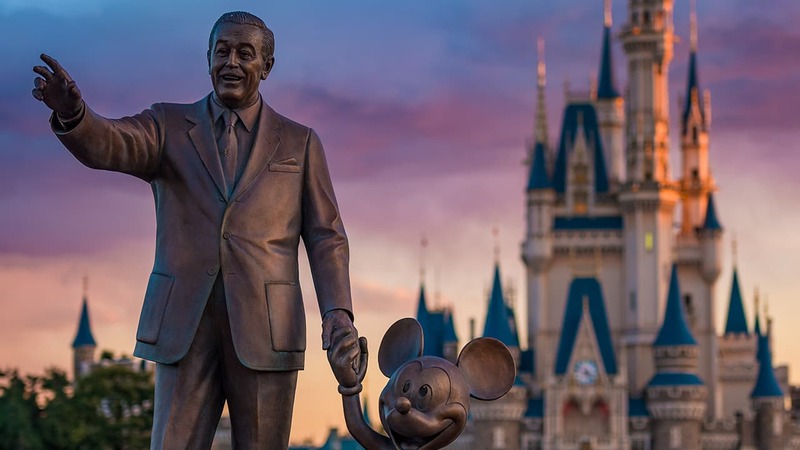 Someone with Disney Reservations even told me over the phone that she has a hunch it could be completed late this year at the rate they’re going…..I hope this is true! Any info on that? What construction is actually left to complete? We will be there for Disney Marathon Weekend, we were hoping that it would be open then but, we doubt it will. Well guess we have to plan another trip back. Can’t wait to go back down and see all of the new Fantasyland! Will this coaster be more of a thrill ride along the same kind as Space Mountain & Rock N’ Roller Coaster or is it going to be more of a thrill ride like the Barnstormer? Looks interesting. Shame it had to open at the expense of the Snow White dark ride, though. 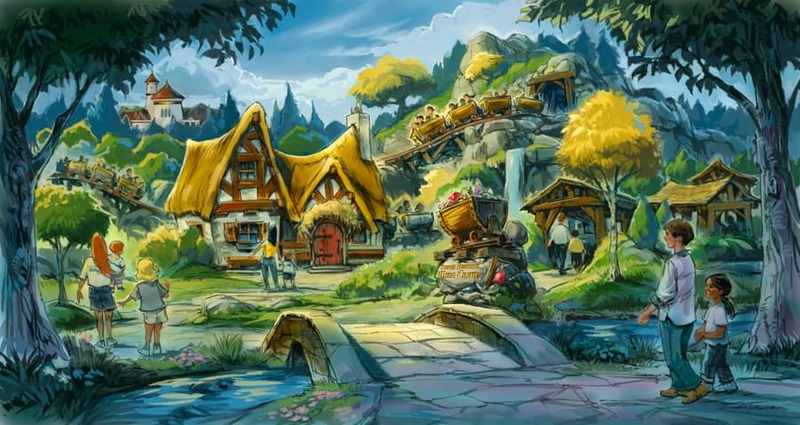 What is the scheduled opening date for the “Seven Dwarfs Mine Train”? 2014 is all we know at this point. Its great a new coaster is being added and it looks really good. The Snow Whites Scary Adventures didn’t need to be taken out though! I have to say that I am a bit disappointed that this won’t be open in September when we visit. This will be our boys’ first trip to Disney. We’re staying at the Art of Animation, purchased 6 day passes and got the Dining Plan for just a small up charge from the Quick Service plan (which was included for free as part of the Free Dining Plan promotion plan). Trying to get all of the dining reserved now. YES! I just wish it was going to be done later this year when we visit. Can’t wait to go back next year!! My home away from home.Looks awesome!! I hope that I’m there when it opens. Wow, you must really like the changes! The area is great, isn’t it? I’m 77yrs young and my companion is 81 yrs young we go to DW 2 times a year n will there in Dec .now we can’t wait 2014….. Loved the New Fantasyland, the kids and I peeked our eyes through to get a glimpse. We would love to know when it’s opening so that we can plan to enjoy the attraction. New Fantasyland looks good. However, is there any chance that Mickey Mouse’s House will return. You would be amazed how many people were upset about its removal. I was since my little nephew was waiting to see it! Can you please tell us if this new ride will be fast pass. We appreciate your help to plan our upcoming trip. When will you know specifics of when it is opening? My Mom and I are coming next year (March 10) and we will be really disappointed if it’s not open! Do we know what the height restrictions will be? Hoping my little guy can go! As soon as we know, we’ll let you know! Looks like it will be a great ride. I was wondering if each car is free swinging during the ride? If so, I would worry a little if I was sharing the car with “energetic swingers” who wanted to swing more than enjoy the ride experience. If that were the case, it might be better if each seat were “swingable”. I admit the two seaters probably look more like mine cars, although there were small cars in some of the old mines. Anyway should be a great ride. Is there an estimated time of year in 2014 to the attraction to open? I’m going in May and wishing it will be up and running by that time! I’m so excited!! 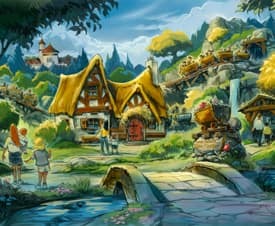 While I will always fondly remember, and sorely miss, the Snow White ride, I’m glad future generations will have such a wonderful example of that great film. Maybe it’ll be less scary for those littler guests as well…? Absolutely cannot wait to ride!!! This will be a blast and I can’t wait to ride it next year! I will enjoy this ride! Ill be coming the first week of Dec , I cant wait …. I was there for the opening last Dec as well Im hoping I will be there for the opening this year as well !!! We can’t wait! My daughter is ready to mark the date on her calendar once this amazing addition is complete! Great job Imagineers! Looks Great! I can’t wait to ride it! Looking forward to seeing the New Fantasyland. When is this roller coaster going to open? All we know is 2014 at this point – it’s still very under construction, as you can see. Stay tuned! Can’t wait to start planning the 2014 trip to go ride this!!! YA! My parents and I saw the new Fantasyland last November on a preview night during MVMCP and it was AMAZING!!!!! Can’t wait to go back!!! I am really hoping they open it before 2014! We are going in October and I’d love to be apart of one of those “soft” openings! I’ve heard this being categorized as a family coaster. Can someone clarify what the difference is between a Family Coaster vs a regular roller coaster. It looks sooo much fun! I can’t wait to ride it. It’s amazing what they have done in the space that once was 20,000 Leagues. Truly amazing. What’s the ride estimated running time? Will it offer fastpass? As soon as we know these details, we’ll share it right here. Stay tuned! Will the ride have a height restriction on it? As soon as we know about a height restriction, we’ll let you know! I can’t wait!! I haven’t seen the changes to Fantasy Land yet either, so I’m excited to see it all! You’ll love it! It turned out to be simply amazing. Anyone know the month in 2014 the coaster might be completed? I’m planning a trip for November, hopefully by then! As soon as we know, we’ll post the date here. Awesome. Can not wait to get back down in Sept/Dec. This will be one of the first things I check out. It’s hard to miss the construction of this new “mountain.” It looks like it will be VERY impressive in size. Can’t wait! Looks like a really fun ride, especially with the swinging cars. It’ll be nice to see the Dwarf’s mine environment too. 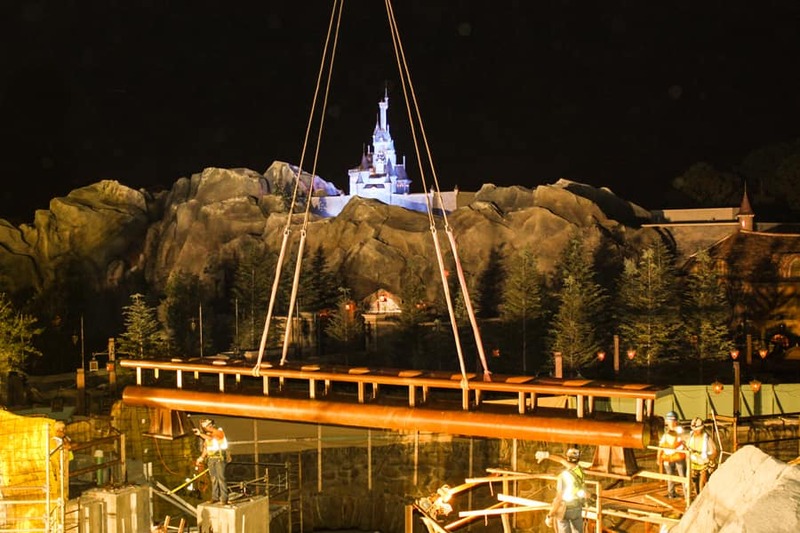 Have you seen the construction in New Fantasyland? It’s HUGE! Should be a ton of fun. This looks awesome, can’t wait to ride it. It reminds me of VMK! That looks like so much fun! And beautiful as well. 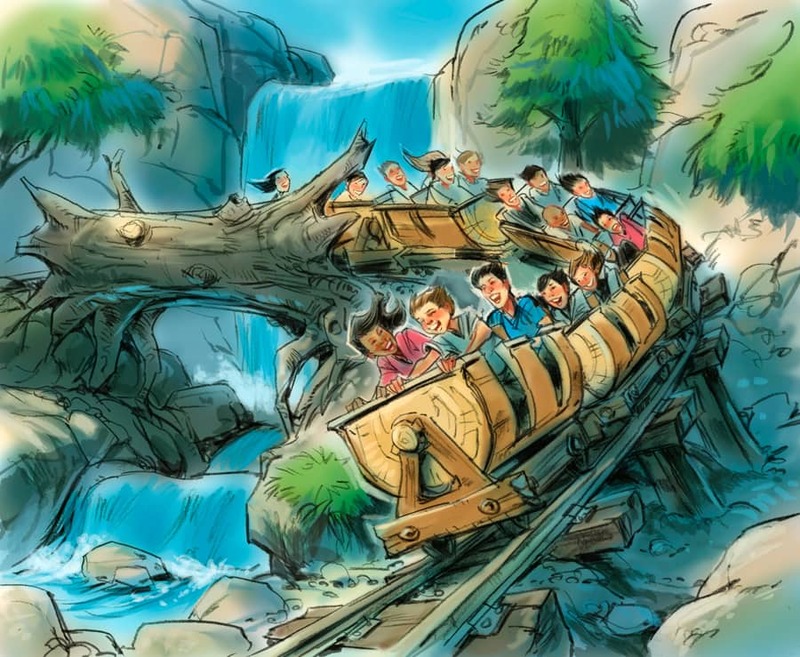 Is the energy of the ride expected to be similar to Big Thunder Railroad? Of course we will go on it…and its more to photograph!!! I can not want for that!! Stoked. Yeah I said it. Can’t wait to take a ride on this one! Me, too. Should be a blast.